ABOVE: SPATEX trade visitors reached 1,478, up 8.5 per cent on the previous year. 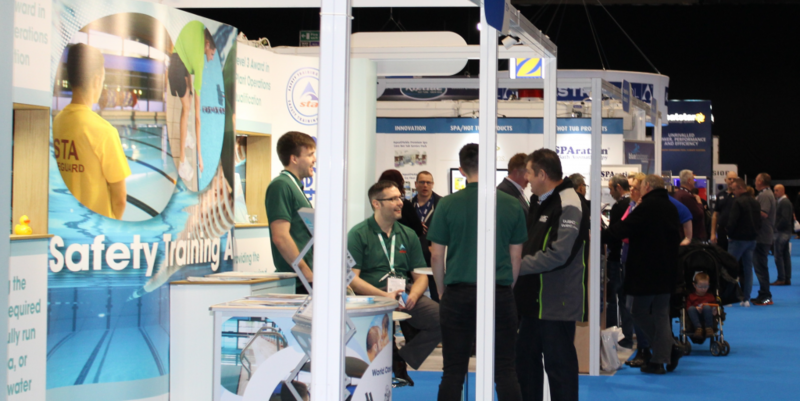 It was a case of quality and quantity at this year’s three-day water leisure show, SPATEX, at Coventry’s Ricoh arena. The annual showcase for the latest in swimming pools, saunas and steam rooms, saw a significant increase in commercial visitors, including a nine per cent year-on-year rise in those representing the holiday park sector. Official figures put the number of trade visitors over the three day show at 1,478, up 8.5 per cent on the previous year. Show organiser Michele Bridle: “The signs were there from the outset that 2018 was going to be a good year so we increased the size of exhibition space in the autumn and this quickly sold out. “I’m delighted to say that the show’s success outstripped even our expectations, with an almost nine per cent increase in unique visitor numbers. SPATEX is well and truly established, not just in the UK, but internationally, representing the global wet leisure industry in its broadest sense.” EDUCATION FOCUS One of the highlights of the show was the double seminar and workshop programme spread over the three days. Offering an unparalleled source of free industry training and education, they provided visitors with updates and tips on topics ranging from control panel technology and swimming pool liners to the latest trends in water disinfection. The breadth of knowledge on display was very impressive and gave audiences plenty of food for thought to takeaway Ross Alcock, in charge of the Institute of Swimming Pool Engineers’ (ISPE) programme of workshops, confirmed that the first day of the show notched up the highest number of delegates ever. “SPATEX 2018 looked and felt dynamic to the point it was probably the best in the show’s history,” and he added: “We can’t wait for 2019!”Of particular interest were talks on the upcoming Biocidal Products Regulation (BPR) which could have far-reaching SURVEY RESULTS Organised by the British Swimming Pool Federation, SPATEX brings the entire water leisure industry together under one roof. What better opportunity, therefore, for Golden Coast to use the show as a platform to publish the results of its annual Wet Leisure Survey. The first Survey was in 2011, with the results published at SPATEX 2012. “The original concept behind the Survey was simply that other industries had facts, figures and statistics that were freely available to help people make better decisions and grow better businesses – and our industry should be no different,” says Golden Coast’s Managing Director Jamie Adams in the Survey’s introduction. “Over the years the Survey has gathered the support of the BSPF and an increasingly large number of business owners who have responded to the Wet Leisure Industry Survey questionnaire and provided the information and insights you now find in the report.” SPATEX was graced by Olympic golden boy, diver Jack Laugher present at CPC’s stand. “CPC has been sponsoring Jack for the last four years,” explained the company’s Marketing Support Manager Scott Barnett. “It’s a great partnership that has worked well for both of us. Not only do we get some great exposure being associated with Jack – more importantly, we’re able to support him financially so he can train full-time and not worry about having to hold down a full-time job.” EYE-CATCHERS This was Czech pool manufacturer Niveko’s fourth SPATEX and the company’s centrally-placed stand was a real eye-catcher. “The UK market is very important for us, so we simply have to be at SPATEX,” explained Jana Kubíková from the company’s marketing department. “We only sell direct to end-users in the Czech Republic –pumps or other equipment,” said the company’s General Manager Dyfed Thompson-Smith. “Do people want to touch a pump? Probably not!” Instead the company promoted its 2018 catalogue digitally and in hard print form with a strong team presence on the stand. “For us, it’s all about talking to people, be they existing customers, potential customers and even ex-customers. We want to answer their questions and, if they need any product information, we can provide it at the stand.” Prominent, the metering technology and water treatment and disinfection specialist, was promoting two new control systems, for opposite ends of the market. The Hydro Touch, from newly-acquired French company Syclope, is a budget control panel for private pools. Monitoring and controlling pH/ORP and temperature, the Hydro Touch has an overdosing alarm and provides self-diagnosis of electrodes, amongst other useful features.51everywhere else we sell through our partner network. “At SPATEX, however, we get a mixture of end-users and installers visiting us to find out about our extensive range of custom-built pools – and especially our monopools, which are our speciality.” OASE, the Belgian manufacturer of automatic pool covers, was celebrating its 50th anniversary at the show. “The UK market is extremely important to us,” commented Oase owner Frederic Claeys. “These is a lot of money in the south of England especially, and people love investing in pools, so SPATEX is an essential show for us to attend. It gives us a great opportunity to meet and network with existing and potential pool building partners.” COOL BLUES Certikin maximised the potential of its usual big presence at SPATEX, and this year the company was promoting two very different products: the blue connect smart pool analyser and Tielemann moving floors. “It can sometimes take a few years for new products to have an impact, but these two have had a really positive response right from the start,” explained Catherine Saunders. Blue connect is a nifty little device about the size of a small thermos flask. It simply floats in the pool, monitoring temperature, pH, disinfectant levels and water conductivity 24/7 and reports back via an app. Tielemann’s floating floors turn pools into multi-functional spaces. While the floor is submerged the pool can be used at any depth required; when raised to the surface, the pool is out of sight and the deck can be used as extra floor space for entertaining. Both part of the giant Spanish Fluidra Group, Certikin’s sister company, Astral Pool UK took a minimalist approach to the show with no products on its stand. “We didn’t see the point of displaying REVIEWT argeting the other end of the market, the company was showing the Dulcomarin measurement and control system. Described by the company as ‘your digital link to the technology of the future’, the system can be used with any type of pool and enables energy- and cost-efficient control of the poll, according to the company. Also on show was the company’s new UV system. “We are mainly known for our dosing pumps, but we do a lot more, including UV,” said External Sales Engineer Rob Winning. “This new UV system is really getting people’s attention.” PROBLEM SOLVERS Lovibond’s Sales Manager Colin Day was keen to stress that the company positions itself as more than just a manufacture of water testing equipment. “We’re far more than that and really want to be known as the water testing and analysis experts. Our focus is now how we can help customers solve their problems.”The company was promoting two products that show the breadth of its market. The Scuba 2, a small, compact, easy-to-use digital water tester for domestic pools and designed for the five most important tests: free chlorine, total chlorine, pH, alkalinity, cyanuric acid and bromine. For commercial pools the company was showing its MD 110 photometer with integrated Bluetooth® functionality. Save the date! SPATEX 2019 takes place from Tuesday 29th January – Thursday 31st January 2019 returning to the Ricoh Arena, Coventry.